II cl. (L. x dalhansonii x L. tsingtauense) H:(pre-1972), G:&I:(1972, as 'Tsinson'): E.Robinson N:(as above) & Reg:(1994): D.Dale. 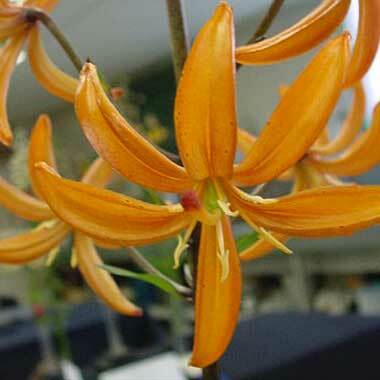 Fls dull orange inside, brownish orange outside; unspotted; nectaries orange; anthers white, lacking pollen. Fls 80mm wide, out-facing; petals 42 x 12mm, not ruffled, tips slightly recurved. Lvs whorled, 180 x 32mm, mid green. Stems 1.2-1.5m, black, with some green mottling and c24-32 fls. Early July. Syn. 'Tsinson' (an illegitimate name).